Much of what we hear about who gets to the top, and how, is wrong. Those who become chief executives set their sights on the C-suite at an early age. In fact, over 70 percent of the CEOs didn’t have designs on the corner office until later in their careers. You must graduate from an elite college. In fact, only 7 percent of CEOs in the dataset are Ivy League graduates--and 8 percent didn't graduate from college at all. To become a CEO you need a flawless résumé. The reality: 45 percent of CEO candidates had at least one major career blowup. ELENA L. BOTELHO grew up in Azerbaijan and Russia in a family of mathematicians, and earned her MBA from Wharton. She has advised over 200 CEOs and boards in nearly two decades, first as a strategy consultant at McKinsey and currently as a senior partner at ghSMART. KIM R. POWELL grew up in Atlanta, and earned a BA from the University of Notre Dame and an MBA from the Kellogg School of Management. Over the last twenty years, Kim has applied her passion for helping people to her role as a trusted advisor to CEOs and high potential leaders, first at the Boston Consulting Group and now at ghSMART. "Well-researched, practical and eye-opening...Botelho and Powell effectively demystify the path to becoming more successful. Instead of one CEO trying to impart knowledge about how to get ahead, Botehlo and Powell change the game by providing you practical wisdom distilled from 2,600 leaders about what really causes people to achieve their potential. The CEO Next Door is like having 2,600 mentors take you under their wing." "Based on extensive data from 17,000 assessments and field tested experiences, Botelho and Powell provide a compelling and concise roadmap to help you identify and develop your executive talent." "Botelho and Powell challenge conventional wisdom to deliver the most useful and credible book on career success I’ve seen in years! The CEO Next Door offers a rare view behind the scenes on how leaders get picked for coveted roles and how they really succeed and fail. . . refreshingly candid and deeply researched. Whether you aspire to CEO role or are just starting out your career, The CEO Next Door will raise your odds of success and protect you from painful stumbles." "A first-rate guide for aspiring CEOs as well as for those who have already moved into the top spot. Botelho and Powell’s compelling research and real-life stories provide a practical roadmap to leadership and career success that readers can apply in any setting." "CEOs come from different backgrounds in terms of economic status, education, family, gender, race, color, country of origin and sexual orientation. Majority of them do an adequate job, some of them perform exceptionally well while few are utter failures. Everyone have a unique story of their journey to get to this destination. So what differentiates the top performers, mediocre performers and the laggards? This seminal work by Elena and Kim does an outstanding job of identifying habits and traits of super stars versus average performers. The frequent references to real situations and real people makes the book even more credible. The book ends on an optimistic note that everyone in any leadership position with determination and drive can master the skills. A must read for those who aspire to make a difference." With a 'Moneyball' approach to leadership, THE CEO NEXT DOOR uncovers 4 well researched CEO behaviors and shows the path to get to the top and stay there. A must read for aspiring leaders, CEOs, board members, and anyone responsible for grooming future leaders. "Clear, practical guide on how to run any company, large or small. It’s not about credentials, breeding, looks, experience or resources, but about how one makes decisions, adapts to change, shows empathy and collects information. The CEO Next Door explodes the myths behind what it takes to get to the top and provides what works, regardless of gender or background. Eye-opening and operational." "What an invaluable book. With colorful stories and interviews, and solid, in-depth data to back up its points, The CEO Next Door is the next must-read for business leaders of all types!" 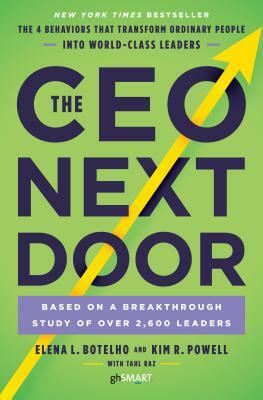 "The CEO Next Door is required reading for anyone who aspires to the C-suite and wants to thrive there. The analytics-driven insights in the book uncover traits of effective leaders that anyone can develop." "Being a CEO is not about background or good fortune but about performance and hard work based on decisiveness, impact, reliability and adapting boldly which sets the stage for any future or current CEO. I enjoyed every page of this book. A must read for all those who care deeply about leading well." "Botelho and Powell have brought big data and analytics to one of the critical bastions of business: the individuals who make it to the corner office. Their insights into business leadership has the promise to be a game-changer for companies, leaders, and everyone who aspires to get ahead."